Every now and then, in a time of need, the right person arrives at just the right time — and something amazing happens. 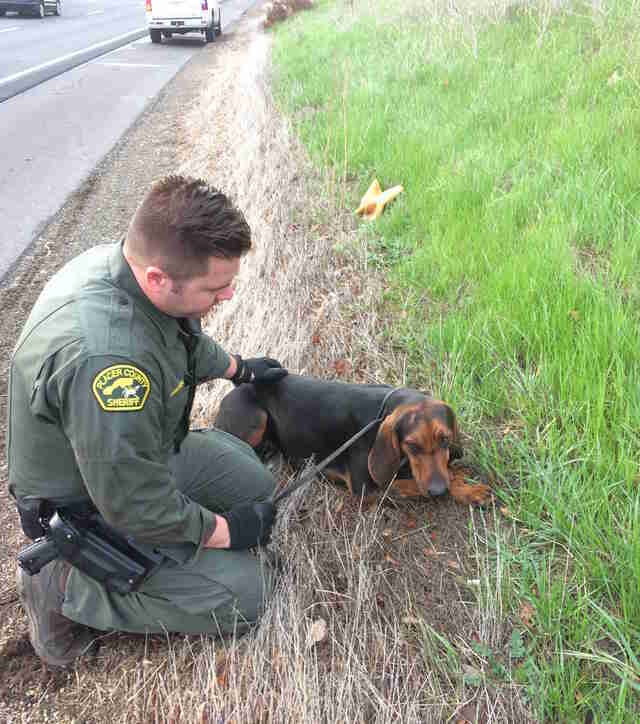 This was the case on Wednesday morning when a lost bloodhound named Ruger found himself trapped on Northern California’s Highway 80 in the midst of rush-hour traffic. 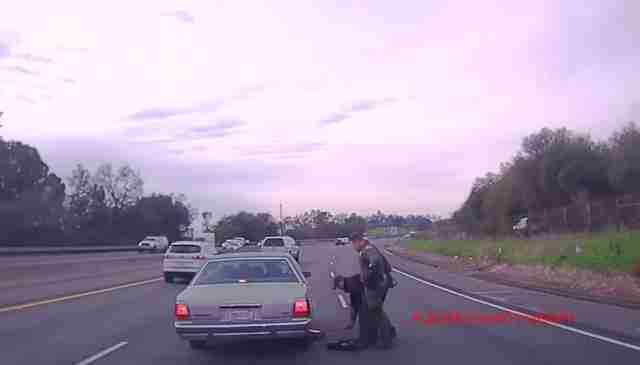 Deputy Stanislav Semenuk, a K-9 handler for the Placer County Sheriff's Department, happened to be behind the wheel when he saw an animal dart across lanes of eastbound traffic. 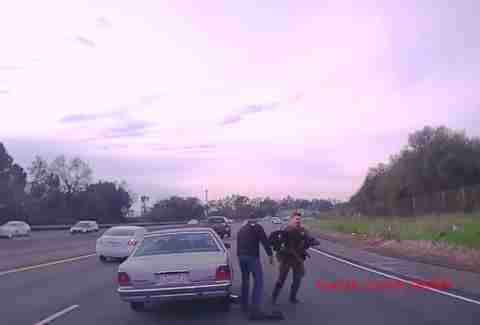 As cars began to slow on the highway, the dog got spooked and bolted back into traffic — this time with tragic results. Ruger collided with a passing car. Ruger was pinned under the front bumper, but the car didn’t stop, and the front tire rolled over his paw, trapping him underneath the vehicle. Semenuk ran across the lanes and told the driver to stop the car and put it in park. 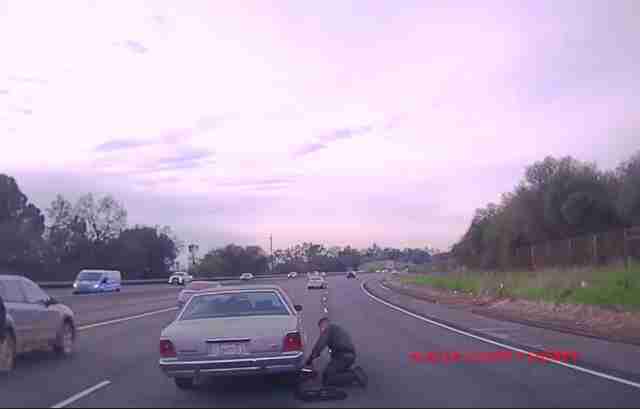 The officer grabbed a jack from his truck, and the two set to work lifting the vehicle off the pinned dog. As the car rose, Ruger’s cries and whimpers reached a crescendo, and Semenuk fashioned a makeshift collar from a leash he had on him and put on his gloves, preparing for the worst. “The dog was awesome,” Semenuk added. “He was a good boy, and let me touch him, pick him up and take him off the highway.” Motorists found the scene surreal, watching from behind their windshields as one officer jacked up a car in the middle of a busy road, and the other rushed to the shoulder cradling a wounded dog in his arms. Semenuk waited with the dog, speaking calmly to him and comforting him the best he could until help arrived. Animal control rushed the pup to a nearby emergency veterinary clinic, where he was treated for swelling, lacerations and road rash, but, shockingly, no broken bones. Happily, that wasn’t necessary, and the puppy has since been reunited with his owners. How the dog managed to survive such an impact with barely a scratch is in a big part thanks to the cops' heroic efforts. “He’s going to be A-OK,” Semenuk added happily.